Russian tax officials have begun an audit of troubled oil giant Yukos' 2002 accounts, raising fears that it could be issued with yet another tax demand. The firm already faces a $7bn bill for 2000 and 2001, and a third demand would lift the total higher still. 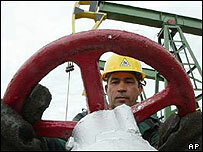 News of the fresh audit took the gloss off a rare legal victory won by Yukos earlier on Monday. It came when a Moscow court quashed a $223m fine imposed on the firm after it missed a payment deadline last month. The fine was issued in early July after Yukos failed to pay the $3.4bn it owes for 2000 within the time set by the authorities. On Friday, bailiffs were reported to have extended that deadline until the end of August. The court's decision to scrap the fine, and the extension of the payment deadline, have given the firm some breathing space. However, Yukos has said it does not have enough cash to pay the bill for 2000, and cannot raise the money by selling assets, as most of these have been frozen by the authorities. The company has warned that it will be forced into bankruptcy unless the government agrees to let it pay over a number of years. Officials have so far not responded to its requests for a more flexible payment arrangement. Some analysts believe the government's hard-line stance indicates that it aims ultimately to break Yukos up and sell it to smaller, less independent oil enterprises. Some Kremlin officials are said to be keen to regain control over Russia's lucrative oil industry, which they believe was sold off too cheaply during rushed privatisations in the early 1990s. Separately, it emerged on Monday that former Canadian prime minister Jean Chretien was acting as a mediator in the dispute, a development which lifted Yukos shares by 10% on the Moscow bourse. The government's crackdown on Yukos' tax affairs is widely seen as retribution for the political ambitions of its former chief executive, Mikhail Khodorkovsky. Mr Khodorkovsky, who has been in prison on charges of fraud and tax evasion since October, had given financial support to opposition parties. Analysts say this breached a tacit agreement between the Kremlin and Russia's business elite to stay out of politics in return for avoiding an investigation into their financial affairs. The Russian tax ministry's case against Yukos centres on tax minimisation techniques used by the firm. Yukos has claimed these techniques were legal, but the tax ministry says they were not.